This is such a brilliant proposal. The man takes his girlfriend and the whole family to the beach and as they’re walking along, one of the little girls pretends that she stepped on something and is hurt. The whole family gathers around to inspect what she stepped on and they dig out a bottle with a message in it. The cork is plucked out and the girlfriend unwraps the message hidden in the bottle. She begins to read it, with absolutely no clue what is going on – she genuinely believes she’s reading a random message in a bottle and has no idea it’s meant for her – until her boyfriend gets down on one knee (she hardly even notices, she’s so busy reading :)) and pulls her to face him. The surprise on her face is adorable. 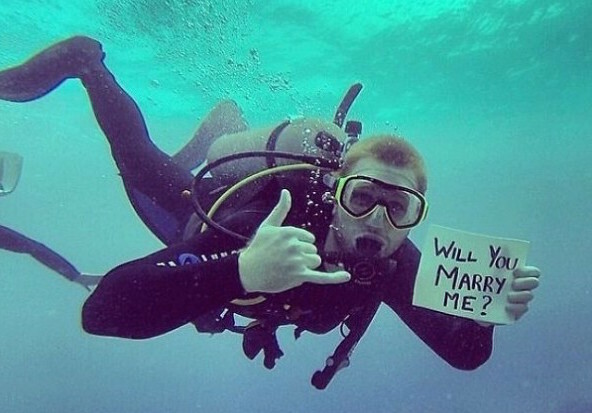 A lovely way to propose with your loved ones nearby. For a woman who loves fairy tales – this is a dream marriage proposal. It begins with the girlfriend being “kidnapped” by Peter Pan and another guy. Then, she’s taken to a house where fairy tale princesses do her makeup. She’s dressed in a beautiful gown from Beauty and the Beast. In the backyard, all her friends and family are gathered in fairy tale dress and she wanders around collecting messages given to her by various Disney princesses and watching videos recorded by her family and friends. The video messages are stories of the couple’s lives, told in a clever fairy tale manner. The proposal ends with the boyfriend riding in on a <strong>white horse</strong> – yes, a real white horse. By the time he jumps onto the ground, it’s crystal clear what her answer is. Very, very creative, extremely well-planned, and a wonderful way to incorporate all your loved ones in your special moment. A girl named Ginny goes to the movies with her brother. After the trailer for the Hangover 2, she watches a trailer of two people talking – her boyfriend asking her father for her hand in marriage. The scene ends with her father granting approval and the boyfriend running toward the movie theatre. It ends with the boyfriend bursting into the theatre and getting down on one knee. Absolutely love how well planned this was and all the beautiful underwater scenery involved. The boyfriend takes his girlfriend to Mexico where they scuba dive checking out the beautiful underwater pyramids. 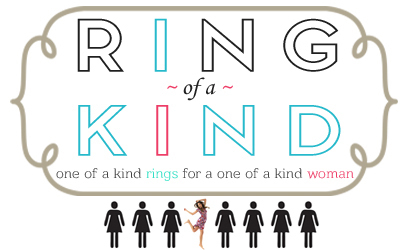 Pretty soon, stumble across a Mayan pyramid with a hidden treasure inside – her engagement ring. 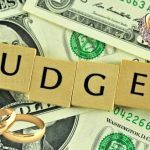 There are no words and the couple is both covered in scuba gear – but you can still sense the excitement and the surprise. This is a great, creative proposal idea caught on tape. The boyfriend takes his girlfriend out for dinner, but instead of going straight to the restaurant, he insists on stopping by to watch a street magician – who he hired, of course. The final trick is when the girlfriend is asked to wave her hand over a card her boyfriend is holding…she does so and he flips it over to reveal the message: Will you marry me? The cutest part is how she can’t quite believe it’s not just a magic trick. 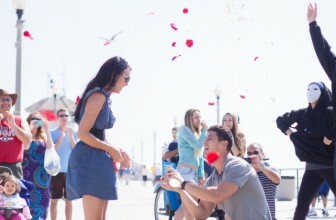 This is one of the cutest proposals – with both the boyfriend and the girlfriend left teary-eyed. They both look genuinely happy – wish them the happiest life together! 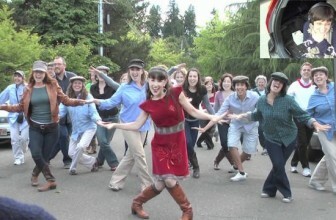 Great surprise marriage proposal orchestrated by the groom-to-be and his group of friends. The girlfriend was told there was an artist displaying new works in an exhibition titled My Early Muir Owl – which obviously was a total sham. The gallery was beautifully decorated with laser-cut foam pieces that spelled out “Will You Marry Me” when propped up on metal poles. Totally beautiful moment when the girlfriend realizes that the whole gallery has been set up just for her and all her friends are gathered for the immediate engagement party. The best marriage proposals are the one uniquely tailored to you and your girlfriend’s relationship. This is why this is such a great proposal idea – the boyfriend hires a team to transform the entire apartment into a den highlighting all of their shared memories. It’s then decorated with soft lighting and dozens of soft white balloons. When the girlfriend steps into the transformed apartment, she gets to explore all the photos of their memories together, which are scattered all over the entire apartment. By the time he walks in and gets down on one knee, she’s already in tears. A woman leaves her office for lunch and finds that her car is missing. She calls her boyfriend and he tells her that her car is on its way. A limo soon arrives to pick her up. Inside, a video recording of her boyfriend lets her know that he just wanted to take her away from the ordinary for a day and to meet him for lunch. 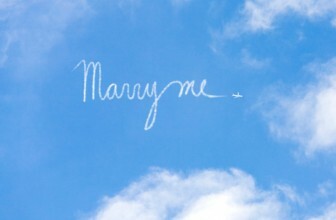 We love this proposal for its simplicity and creativity. The guy arranged all of it on his own – even the cameras were set up by him. 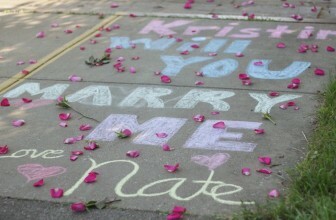 A beautifully creative proposal single-handedly orchestrated by a clever man. …and then he busts out with a whole LIVE music video. This proposal gets five stars for awesome planning. He asks his girlfriend to take the dog for a walk and then all of a sudden, there’s LIGHTS – MUSIC – and all their friends are there. 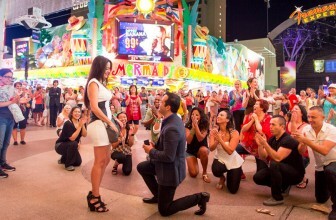 The only downside to this proposal is that he spends the WHOLE time performing. It’s a great performance and you can tell he went through a lot of trouble to plan it, but it’s just a tad long and ALL the focus is on him. The whole time. He raps, he does skits, he dances…and he’s good. Adorable scene right from the movies – specially, the movie 10 Things I Hate About You. This guy waits until his girlfriend is about to address a football stadium full of people to raise money for her dance team. Suddenly, her mic doesn’t work and you hear the beginning chords of Can’t Take My Eyes Off You. His girlfriend looks up to see her boyfriend making his way down from the bleachers, mic in hand. He meets her down on the pitch and gets down on one knee to the uproarious applause from the audience. Great idea from a great movie. Imagine going to see your boyfriend’s Broadway performance and after the fantastic show, and clapping wildly for the cast – he gets down on one knee and proposes?